In this lesson we take our final look at the basics of the CSS box model by looking at borders and the twenty CSS properties available to use with them. Don't let the amount of CSS properties available for borders fool you into thinking they are complex though, because borders are very simple to understand and use. 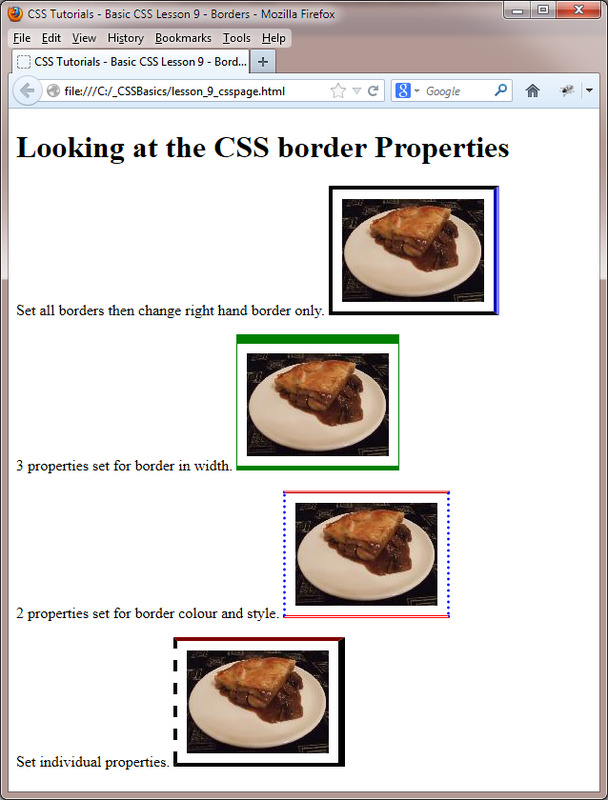 Borders have colour, style and width attributes that can be set using CSS. The twenty tags available for use with borders are used to set these values individually for each border side, or for all borders using some neat shorthand CSS properties. Specifies the colour of the top, right, bottom and left borders respectively. Shorthand for specifying the border colour for all four borders of a box. Specifies the style of the top, right, bottom and left borders respectively. Shorthand for specifying the border style for all four borders of a box. 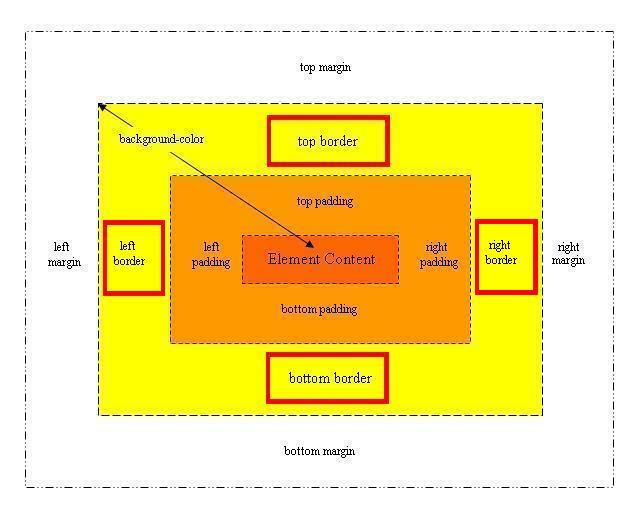 Specifies the width of the top, right, bottom and left borders respectively. Shorthand for specifying the border width for all four borders of a box. Shorthand for specifying the border colour, border style and border width of the top, right, bottom and left borders respectively. Shorthand for specifying the colour, style and width of all four borders of a box. Wow! What a lot of properties to get our heads around. But wait its just colour, style and width with some neat shorthand to cut down on the CSS. Lets take a look at the CSS border properties to see their effects on the box model. Open up the file with Notepad we created and tested in Lesson 8: Padding & Margins. <p>Set all borders then change right hand border only. <p>3 properties set for border in width. <p>2 properties set for border colour and style. Save the file in the C:\_CSSBasics folder as lesson_9_csspage.html and close the Notepad. There are a lot of CSS border properties available for us to use. Just remember that you can use a shorthand property and then overwrite specific sides of the border using a particular border and modifier. This really cuts down on the style code and makes the style more readable. For brevity, only	some of the properties available were used in this practical. For an in-depth review of all the border properties see the individual properties in the reference section. Modify the code and utilize some of the border properties not used in the practical. Although you can write the colour width and style in any order its better to be consistent when using borders, so settle on an order and stick to it. Our preference when we write borders is width, style and colour, but the choice is yours to make. We conclude the CSS basics tutorials with a round-up of the CSS properties used in this section.